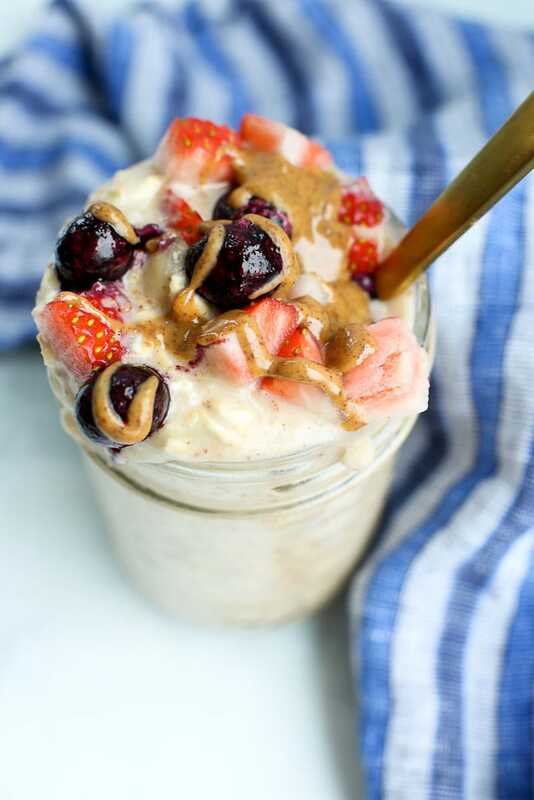 Overnight Oats are the perfect make ahead healthy breakfast! Make all of these and have breakfast ready for the week! Have you tried overnight oats yet? It took me the longest time to even try them because the thought of cold oatmeal sounded most unappealing to me. One day, I caved. I had to see what all the fuss was about. I’m so glad I did because overnight oats are the perfect breakfast food and cold oats are not nearly as weird as I thought they’d be. The best part about overnight oats is that you can mix the ingredients ahead of time, which takes less than five minutes, and breakfast is ready when you wake up! THE BEST. These will last in the refrigerator for up to five days. Basically what’s happening is rolled oats are sitting in liquid overnight and the liquid is “cooking” the oats. By morning, they are soft and ready to eat! Don’t love the idea of cold oats? You can eat overnight oats cold or warm! If you prefer them warm, just pop them in the microwave in the morning for a quick, 30 second heat up. Overnight oats are really customizable; everyone seems to make them slightly differently. I’m sharing five healthy recipes for you today that take on different flavors. All of them start with the same basic ratio of 1/2 cup oats: 1 cup liquid. I mostly prefer to use old-fashioned oats and a non-dairy milk, but you can use cow’s milk if that’s what you keep on hand. I only occasionally use yogurt, so only one of these overnight oats recipes is made with Greek yogurt. I just prefer the texture without yogurt, but I do love how the Greek yogurt adds some tanginess and extra protein. Many overnight oats recipe contain chia seeds. I don’t usually use them because I’m not a big fan of the texture chia creates unless blended. 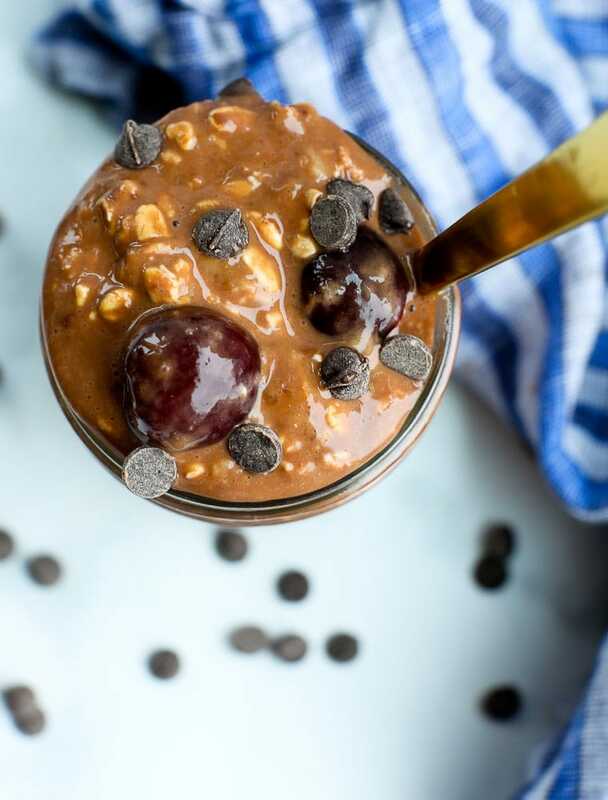 You absolutely don’t need chia seeds to make overnight oats, but if you want you can certainly add a few teaspoons to any of these recipes. The last thing you need to know about overnight oats is how to sweeten them. In three of these recipes, I sweeten them naturally with a mashed banana. Note that the sugar in those recipes is all natural sugar from the fruit, there is no added sugars at all. If you hate the flavor of banana (it’s never overpowering, but you can taste it a little), you can take it out and add a tablespoon of liquid sweetener. Honey, maple syrup, or agave nectar all work great. The recipes that don’t use banana are lightly sweetened with a liquid sweetener. One tablespoon is perfect for my taste buds, but if you are used to super sweet, you may need more. You can also use stevia for a no-sugar-added option. I make my overnight oats in mason jars because I pretty much use them for everything, but any storage container will work! I sometimes add nutritional boosters to my overnight oats. You can watch this Facebook Live video I did showing you exactly what I add and why I add them in, and I also demonstrate how to make overnight oats! Here are my current five favorite healthy overnight oats recipes. I can’t even pick a favorite because they are all so tasty! Please let me know which one you love best. Lite coconut milk is the “cream” here and this is a dreamy breakfast! With a touch of vanilla and just enough sweetness, if you’re a strawberry lover, you MUST make this one. I love carrot cake so much! (Evidence: this recipe, this recipe, this recipe, and this recipe!) If I can have all the flavors of carrot cake in a healthy breakfast package, I’m gonna do it. And I do. Often. You should, too. You can’t beat chocolate for breakfast! Cherries + chocolate make a perfect combination. Use fresh cherries when in season, but frozen cherries work great here, too. Cherries are full of antioxidants and cancer-fighting nutrients, so they are a great addition to your breakfast! This is the recipe that made me fall in love with overnight oats. I just love the almond butter + berry combination. You can substitute any nut butter, peanut butter, or sunflower seed butter if you prefer. Either way, I know you’ll love this one. Optional: add additional berries and almond butter as toppings. *I use whatever I have on hand: strawberries, raspberries, blackberries, or blueberries are all favorites. If you want some extra protein and tang to your overnight oats, give this recipe a try! This time I pair another favorite combination: chocolate + coconut. YUM! This one is thicker than the others, so if that will bother you, adjust the amount of yogurt and milk used to have more milk and less yogurt. Add optional toppings, if you prefer. If you love oatmeal, you’ll probably love all of these healthy oatmeal recipes! Enjoy! Please note that links to products are affiliate links. Thanks for your support! I loooooove overnight oats and am so excited to try these!! Thanks!